By noon on Monday the river had already begun to spill into the boat ramp on the Pomeroy Parking Lot, completely covering the amphitheater. OHIO VALLEY — Excessive rainfall over the weekend caused flooding in portions of the area and even a school closure on Monday, as residents now shift their focus to the Ohio River. The rains brought flooding in areas around State Route 124 near Rutland and Langsville and State Route 143 just outside of Pomeroy which lasted into Monday, cancelling school for Meigs Local Students on Monday. As the streams and creeks return to their banks, it is now the Ohio River on the rise. With crests projected on Wednesday in the region, gauges at the Belleville Locks and Dams and Racine Locks and Dams are expected to exceed flood stage on Tuesday. As of 3 p.m. on Monday, a crest at Belleville is projected at a level of 37.4 feet on Wednesday morning. Flood stage in that area is 35 feet. According to the National Weather Service, a water level at 34 feet is when water begins to cover State Route 124 at the mouth of Laucks Run, north of Portland. At 35 feet, State Route 124 is flooded north of Stiversville Road, at Rock Run, at Wells Run to Smith Ridge to Dewitts Run, at Forked Run, at Curtis Hollow Road and between Long Bottom and Shade River. At 38 feet, State Route 124 towards Racine is flooded. Sections of Ohio State Route 248 at Sand Hill are flooded. In Racine, a crest is projected on Wednesday afternoon at a level of 43.1 feet, a little more than two feet above flood stage (41 feet). At 41 feet on the Racine gauge, State Route 124 at Antiquity starts to flood. Areas of Ravenswood are flooded upstream from Racine Lock. At 42 feet, State Route 124 in Minersville is flooded. At a level of 44 feet, West Virginia Route 62 is flooded just below Racine Lock at West Creek. More areas along Ohio State Route 124 are flooded. The water is currently projected to crest just below flood stage in Pomeroy with a level of 45.9 feet. Flood stage is 46 feet. In Pomeroy, 42 feet floods the parking lot at the boat ramp, while at 46 feet the Pomeroy parking lot and the river amphitheater are flooded along river. Main Street starts to flood. Some secondary roads are flooded due to backwater. 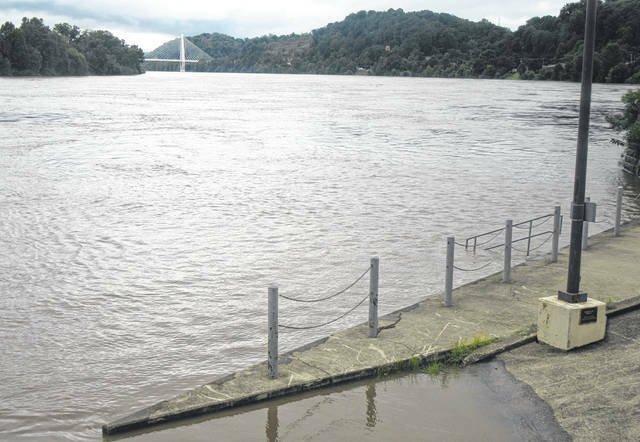 A water level of 48 feet is when water begins to flood businesses along the river, as well as some homes on the West Virginia side of the river near the Bridge of Honor. Both Point Pleasant and Gallipolis are projected to stay below flood stage as of the forecast on Monday afternoon. In Point Pleasant, the crest is projected to be at 39.4 feet, below the flood stage of 40 feet. At Robert C. Byrd Locks and Dams below Gallipolis, the crest is forecasted at 44.9 feet, well below the flood stage of 50 feet. https://www.mydailysentinel.com/wp-content/uploads/sites/14/2018/09/web1_9.11-River_ne2018910155912426.jpgBy noon on Monday the river had already begun to spill into the boat ramp on the Pomeroy Parking Lot, completely covering the amphitheater.